Tooth replacement options | LASAK Ltd. The most common methods of treating lost teeth are dental bridges and dentures, which can help to a certain extent, but both methods also have considerable disadvantages. A bridge needs two firm supports. To build them, two healthy and fully functional teeth, that are irreversibly damaged by grinding and can no longer fulfil their original function, must be used. 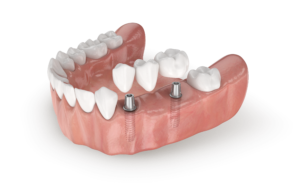 Over time, a denture will fit less and less well. In some patients, the reason for this is the progressive loss of the jawbone tissue under the denture, while others may experience hypertrophy of the oral mucosa under the denture. The wearer of a loose denture is unable to chew food properly, which can subsequently cause severe disorders of the digestive tract. In addition, the denture may also inhibit the patient from enjoying a full social life. An implant is an artificial replacement of the tooth root, inserted in the jawbone, to replace the missing root of the original tooth. 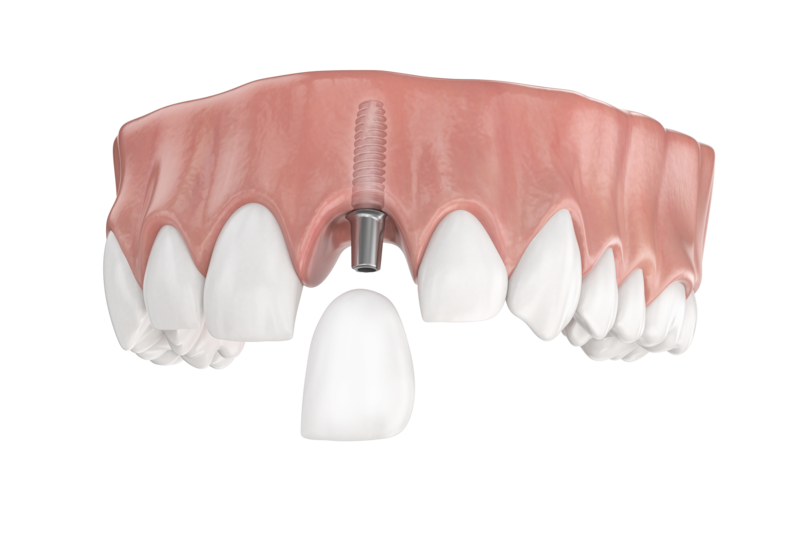 Together with the abutment, it creates a base for attaching the crown. The implant is made of titanium, which is not rejected by bone tissue. On the contrary, it creates a direct and tight bond with it. The implant has the full functionality of the original tooth and no one can see the difference. One option is an implant-supported bridge. It is not necessary to prepare the healthy neighboring teeth and the implants also prevent bone loss and deformation of the face. Implants can also be used as a solution for the loss of all teeth. Thanks to the perfect healing of the implants into the jawbone, there is no need to worry about the teeth staying in place. 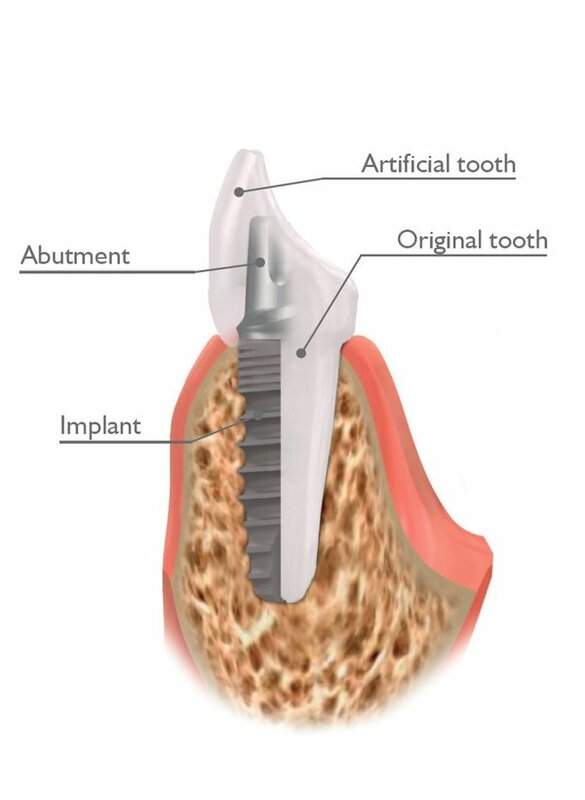 First, the implant, in the shape of a small screw, is inserted into the jaw in place of the removed tooth. As soon as the implant has healed over the following weeks, the abutment is fixed onto the implant. (The abutment protrudes from the gum.) An artificial ceramic tooth, indistinguishable from the original one and with a strong bite, is then fixed onto the abutment. Absolutely not. 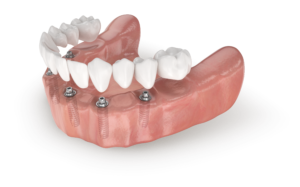 Implant insertion is a regular procedure. It is performed in the dentist’s surgery under local anesthetic. The insertion of one implant takes approximately fifteen minutes. Are implants suitable for me? Our implants are recommended for anyone. They are as suitable for young people who have lost one or more teeth due to an injury, as they are for the elderly. They help fill both smaller and larger gaps, and they can also be used in a completely toothless jaw. The specific application should always be chosen by the dentist with regard to the patient’s overall state of health. To a certain extent, that depends on you. You should pay especial attention to correct oral hygiene and visit your dentist regularly. Poor oral hygiene together with inflammation of periodontal tissue can lead to implant failure.